Throw everything into a food processor and whir away! Or whisk well in a large bowl. Refrigerate and serve with sliced apples, bananas, celery, carrots, grapes, crackers, graham crackers, pretzels, etc. Or mainline it via spoon directly to mouth, as I did a few times last night. Best method for instant gratification. I mean, when you need protein (and peanut butter), you need protein (and peanut butter). Enjoy! 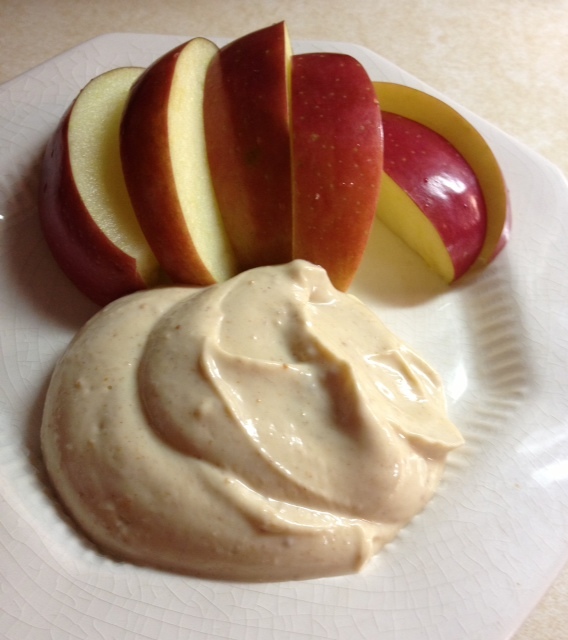 This entry was posted in Dessert, Easy, Fast, Gluten free, Healthy Spin, One Pot, Quickie, Snack, Vegetarian and tagged fruit dip, greek yogurt dip, healthy fruit dip, peanut butter dip, peanut butter yogurt dip, yogurt dip. Bookmark the permalink. This looks great! I put it on my list of recipes to try. It’s very, very tasty!! I was just checking out your bento boxes- great ideas. I will be making this for my oodles of Boodles lol (aka the boos!!) Thanks for the tip! My daughter plays water polo and this is great for before, in between and after games. We have even been caught eating it all. Ha! Amazing, Jean! It’s true- this is such an easy and complete snack. Made this with regular homemade yogurt. Yum!! Almost good enough to eat with a spoon! I put this on my waffles instead of syrup and it was so good! Did you use plain or vanilla greek yogurt? Sarah, I’ve used both with great results. Prefer vanilla a bit. Which did you use? I’m making this for a class of around 25 students, should doubling the recipe be enough? Yes, Shelby, that should work!